Blue Hill Tavern caters to both sophisticated adults and their comfort food-loving inner children. 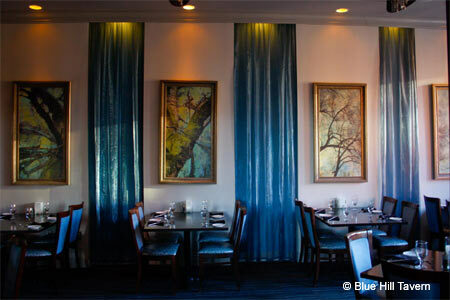 : Blue Hill Tavern, a kid-friendly restaurant? Isn’t that the sophisticated place on Brewer’s Hill with the faux-snakeskin chairs and the pricey sous-vide dishes? They offer a children’s menu from chicken tenders to chocolate chip pancakes. Even better, Blue Hill caters to our own inner child as it pampers the adult in search of fine dining and ambitious flavors. Wild mushroom flatbread with truffle oil, mozzarella and Parmesan is a salute to North Italian fare, and the Wagyu beef Tavern burger on brioche takes burgers to a new level. As for the aforementioned trendy sous-vide, which cooks vacuum-sealed food in a water bath: what is this but a luxurious version of mom’s boil-in-a-bag dinners? (Although we are pretty sure mom’s version never involved Châteaubriand.) You can begin your dinner with fried pickles and banana peppers with chipotle aïoli. Service is friendly and attentive, the décor spiffy-sleek (and yes, blue), and from the rooftop patio bar there’s a nice view of the city lights. It’s easy to find, too: just look for the iconic Mr. Boh sign.